Will ‘forward-thinking’ firms prize people over technology? While artificial intelligence has been buzzing around for some time now, it is something for which a ‘forward-thinking’ firm should have already planned. With the trends going towards artificial intelligence (AI) and machine learning, there remains much speculation about what this means for employment. However, there are also counter-claims that people working in low-skilled desk jobs with repetitive tasks and processes could be liberated by such technologies as these to do more interesting and challenging jobs. It’s therefore important to consider what constitutes a forward-thinking firm. Is it one that deploys new technologies at the expense of its employees, or is it one that enhances their opportunities and skills, while also putting their customers first? From my perspective, an organisation that isn’t just looking at this question now, must now think ahead to develop a plan. 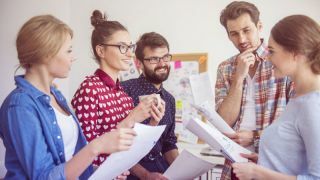 By creating a strategy now, they can future-proof their organisation, become more engaged with their employees, and have the right technology in place to ensure that they can deliver increased customer satisfaction. So, while artificial intelligence has been buzzing around for some time now, it is something for which a ‘forward-thinking’ firm should have already planned. Forward-thinking firms will certainly embrace technologies such as artificial intelligence; and they will invest in developing their staff’s knowledge and skills. If artificial intelligence and machine learning are deemed right for their company and they have not already integrated them. What’s more is that, beyond increased staff and customer retention, they will benefit from having more efficient operations. All of this can lead to enhancements in the customer experience. So, in my opinion, the concept and old adage of ‘People, Process and Technology’ is still pertinent today. If you have the right people, processes and technology in place, then customer enquiries are handled in an efficient manner - subsequently increasing customer satisfaction. If staff can easily follow processes and have no issues with the technology they are using, then they are not frustrated by procedures or operations. Nor, for that matter, will customers suffer any frustration. So, while the people aspect of running a good customer-focused organisation is crucial, companies will still look to embrace artificial intelligence, machine learning, and other pertinent technologies. Artificial intelligence, for example, has been buzzing around for some time now, and this is something a ‘forward-thinking’ firm should have already planned for. AI and live chat can, for example, be used to prequalify an enquirer. This can help agents to make decisions more precisely, as they will have the necessary information to hand. Chatbots can complement human-based live chat, which streamlines communication due to its instant nature; customers are able to have their questions answered quickly and at their convenience. People and technology go hand in hand. People can only efficiently do their jobs if they have the right technology to optimise, and majority of technology still needs to be operated. Even AI still has a human element to it as it needs to be taught and monitored. It doesn’t make sense to drive a car with only 3 wheels, so you wouldn’t drive a business forward with only people or technology. The same applies to business process management, because processes don’t exist as an island. Organisations should always be looking to improve their operations and customer services, and the solution that usually achieves this is about how they use technology within their organisation and the processes they have in place. In many ways it shouldn’t be a choice of people over technology. Instead the discussion should be about how to use technology to improve the human employee-customer experience. People can only efficiently do their jobs if they are given the right technology. Ensure live chat agent availability whenever your customers want to interact with you, which may be at any point from anywhere within 24 hours a day, seven days a week period. If your live chat provider offers training, do it, get as many of your agents involved as they can pick up tips and tricks on how to use the software in the best manner. Train staff to be knowledgeable and empowered to be able to deal with the majority of customer queries. Customers want their issues to be rapidly resolved. They don’t want to play telephone hockey with different agents and different departments. Consider aligning your live chat with your overall operational model. Make live chat available throughout the customer journey, whenever it will add more value to the customer – such as whenever a quotation is received. Analyse overall performance data and per operator which can help your organisation identify any areas for improvement and offer additional training. Regularly review your AI chatbots performance, ensure it continues to answer questions as expected and take time to amend answers and/or teach it new questions and answers. Ensure your AI chatbot can transfer the chat to a human agent when they cannot answer or provide the best possible alternative if an agent is unavailable. Remember to use AI technologies, such as chatbots, to automate chats about basic enquiries, while having the ability to forward them to a human agent to answer more complex queries. This will permit the live chat session to focus on the reason for the customer contact. The thing to do before you look at processes or technology is to look at the people and what they do in their daily role. See what challenges and frustrations they come across with their processes and the technology they use and listen to what they feel they need to improve their job. Once the organisation has this understanding that can start to make improvements to help plug any gaps and improve efficiency. If you force people to do a job a certain way or with tools that aren’t right for the task, you will have dissatisfied employees and this will affect the business with high turnover, sickness or to the level they complete their job. So, a forward-thinking firm will always prize its people, and enable them to do their jobs better with the right processes and technology.